We truly appreciate everyone who has shared their experience with our Express office in Ocala. Your feedback is important to us as we are always trying to improve the services we provide to our community's Employers and Job Seekers! Express Employment Professionals in Ocala, FL is proud to announce our Net Promoter Score from our Annual Client Satisfaction Survey (rated by our clients locally) scored at 92.9%!! Thank you Ocala!! We could not have obtained these results if we didn't have such a great team here in the office, outstanding associates working hard out there every day, and the incredible clients we have the honor of working with on a daily basis. We appreciate your support so very much. Let's keep up the good work!! "Truthfully, The people that we deal with at Express are very honest and value oriented and that means at lot to us.."
What is one thing we could be doing differently to increase the value of our services to you? "I don't know if there is anything you could do differently, the staff at Express is very good at what they do although some of the temps they have sent don't share the same values and honesty..."
"Always had fast great service"
"Quick response from Mark Dollan. When we needed help he made it happen." "We have a great relationship with Brian and his people. He responds quickly and accurately. I can count on him to do what he says he will do." "Continue doing what you are doing." "Very good connection with Express. Everyone I have dealt with has been very helpful on short notice." "Excellent service and no issues to date!" "Brian Ballard and his team are excellent. We can be a very demanding customer and they always meet our need in a professional and responsive manner." 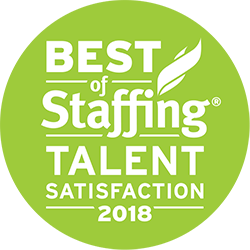 "Nothing - Their great service and ability to provide quality candidates quickly is why we use them as our primary staffing agency."